Download the module lesson notes here. Now that we know the minor pentatonic scale, we can start building the module riff performance. Here is the video build-up in A minor (first third of the performance). It's in four parts. Make sure you can comfortably repeat each section before going on. The video starts with a practice-speed reference performance. The build-up in D minor, which is just the same, is presented in one continuous video. The last third of the piece isn't quite 'to pattern'. Finish off your performance with a well-turned ending. Here are two versions of the unison ending in the module performance. And with the held right-hand octave A. Of course, as noted, you can just as easily finish off with the simple ending. The important thing is to end your performance decisively and dramatically. You should have an 'aerial view' as you work towards a delay-free performance. 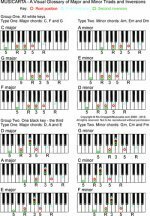 Like a lot of minor pentatonic music, the One-octave Blues is in twelve-bar form. “Twelve-bar” usually means the classic 3-times-4 structure, but here there actually 24 bars in 3-by-8 form (but the same structure). The chord sequence is this. As you know, you don’t actually use the E minor pentatonic scale in the module performance. Here's how to practice the Am-Dm-Am jump. Keep going over the video resources to build and polish your performance. Hum along and tap your foot as you play all the riffs in this module. Minor pentatonic blues riffs like this are very good for 'getting your mojo working'! They're not for sitting quietly and listening politely to!